PanARMENIAN.Net - Concluding a two-day visit to Armenia, OSCE Parliamentary Assembly President George Tsereteli (MP, Georgia) welcomed the ongoing efforts to implement electoral reforms in the country, urging broad political consensus for any changes to the electoral system. He reiterated the OSCE and the Parliamentary Assembly’s commitment to supporting Armenia’s continued democratic development. OSCE PA President Tsereteli and Secretary General Roberto Montella met with President Armen Sarkissian, Parliament President Ara Babloyan, Foreign Minister Zohrab Mnatsakanyan, parliamentary leaders, civil society representatives, members of the international community, as well as students and faculty from Yerevan State University. In his first presidential visit since being elected to the position at the OSCE PA’s Annual Session in July this year, the President welcomed the opportunity to consult with colleagues in the Armenian parliament regarding their priority concerns within the OSCE. In his meetings with officials, President Tsereteli discussed a range of issues including economic development, electoral reform, anti-corruption efforts, regional relations, and Armenia’s work within the OSCE. He reiterated the OSCE PA’s support for the work of the OSCE Minsk Group and its Co-Chairs on Nagorno-Karabakh, but stressed that the ultimate responsibility on delivery of concrete results and progress lies with the political leaderships of the parties involved. “Coming from the South Caucasus region myself, I understand the challenges and sensitivities impacting Armenia. 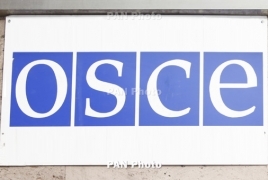 I hope that the authorities will make full use of the range of tools that the OSCE has to offer, to help the country fully live up to the expectations of its people,” said Tsereteli. Noting that both the OSCE Chairperson-in-Office, Enzo Moavero Milanesi and OSCE Secretary General Thomas Greminger have visited Armenia in recent months, the President stressed the strong commitment of the Organization to Armenia’s continued development. To contribute to Assembly activities in the region, the President is expected to appoint a new Special Representative of the OSCE Parliamentary Assembly on the South Caucasus region. The President and Secretary General welcomed the active participation of Armenian parliamentarians in all OSCE PA activities. The OSCE PA will hold its annual Autumn Meeting from 3-6 October in Bishkek, Kyrgyzstan.